This is an extremely well-crafted novel, one that will enthral and convert even the most reluctant of crime fiction readers. The arrival of an elderly American tourist in London mysteriously sets off a seemingly unconnected chain of events. What might have been mere self-indulgence in nostalgia, draws out past misdeeds to seriously threaten the present. Once the Pandora’s box is opened, that Past unravels at breath-taking speed. The action takes in fashionable Chelsea to the less salubrious borough of Hackney, in London, and sweeps to Back Bay in Boston and across the Charles river to Harvard. It encompasses an eclectic cast of characters that come to life from old photographs. What could the murder of a harmless old lady have to do with the KGB, M15, M16 or even an archaic hotelier with difficult, massively wealthy Russian neighbours? 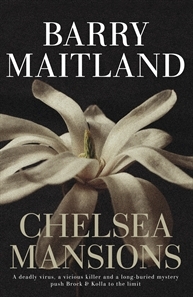 The beautiful construction of “Chelsea Mansions” might well owe something to Barry Maitland’s architectural background. The story rises, like an interesting-looking building, with attractive, simple lines that reveal immensely intricate and complicated details only on closer examination. It immerses and entices the reader to follow every twist and turn. The foundations of the novel lie firmly in the reliable characters of D.I. Kathy Kolla and her boss D.C.I. Brock. Kathy Kolla is likeable – admirably holding her own in a male-dominated and chauvinistic environment; she is hard-working, dedicated and loyal. D.C.I. Brock exists to catch criminals. He is a creature of rare intelligence, his brilliant investigative mind able to pinpoint the right questions to ask. Neither accept appearances at face value. Both have courage and integrity in their pursuit of the truth, where others might have settled for easier, politically-correct compromises. Around these two central characters, Barry Maitland spins his web of mystifying murders and ever-deepening plot; a master craftsman weaving a fascinating, colourful tale incorporating past with present, seemingly unconnected people with each other. Skilfully and subtly, the reader is hooked on the journey from beginning to end, driven so expertly in understated luxury, to a destination reached most satisfactorily. A roller-coaster of a ride travelled in a Rolls Royce.